The year is 1888, the city is London, and a killer stalks the fog-shrouded streets. In the darkened streets of Whitechapel someone is killing prostitutes….vampire prostitutes. And neither the Queen nor Prince-Consort Vlad Tepes Dracula are amused…. Yeah, that’s right. 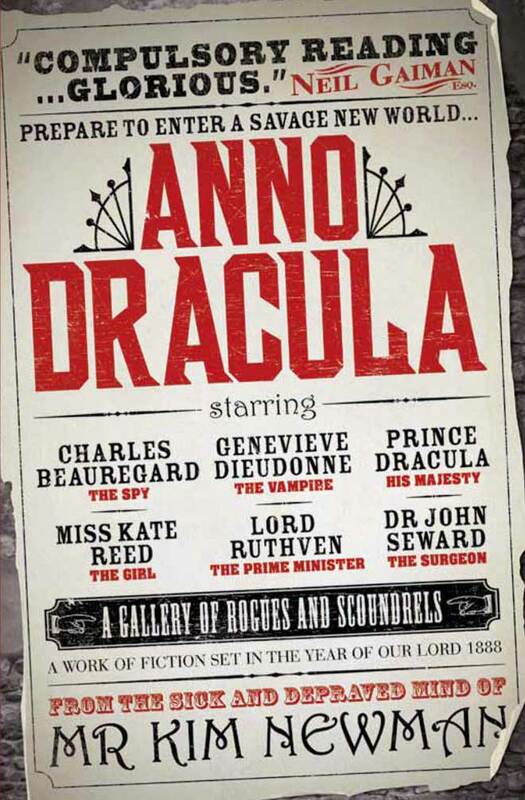 In the world of Anno Dracula Vampires stalk the streets of London, and Dracula sits on the throne. Kim Newman has taken a story that we all more or less know in one form or another and turned it on its head. This is a tale of a world in which Van Helsing and his band of makeshift vampire slayers failed. Now Dracula has married Queen Victoria and rules England as the Prince-Consort. Vampirism runs rampant througout London (and presumably the rest of the land as well) as elder vampires are able to “come out of the closet” and be accepted for what they are while newborns multiply at an alarming rate. Van Helsing’s head adorns a spike atop Buckingham Palace. Quincey Morris and Jonathon Harker are likewise slain, casualties of the awful night when events went awry. Mina Harker is a vampire, part of Dracula’s court. Arthur Godalming has likewise turned and is a rising star in the vampire-controlled government. And Doctor Jack Seward’s sanity is slowly slipping as he works in a Whitechapel charity ward, slipping out at night with silvered scalpel to commit the horrible murders history will remember as the work of Jack the Ripper. Original characters Charles Beauregard, an agent of the Diogenes Club (introduced as Mycroft Holmes’ club by Sir Arthur Conan Doyle and here serving as the precursor to 007’s Universal Exports) and Genevieve Dieudonne, Doctor Seward’s vampiric assistant, both find themselves caught up in the hunt for Silver Knife or The Ripper as tensions between the turned and the warm threaten to tear London to pieces…. I first ran across mention of this book in a work on Dracula where in an appendix the authors gave an overview of notable works featuring that undead nosferatu. I idly noted that it sounded like a book worth reading, then promptly forgot about it. I then found it at Barnes and Noble on its rerelease, with a prominant endorsement from Neil Gaiman on the spine and front cover. I don’t know about you, but when Neil Gaiman recommends something I pay attention. I am exceedingly glad I did! I plan to now track down and read the rest of Newman’s bibliography, starting with the just-released sequel Anno Dracula: The Bloody Red Baron. First off, read Bram Stoker’s original novel. You won’t regret it. Its a classic for a reason, and you will need to know the story and characters therein to get the most out of Anno Dracula. If you are a hopeless cretin and refuse, at least do the CliffNotes or something. Seriously. Then read this book. Given the premise, this is obviously not a story for children. Jack the Ripper’s victims were prostitutes, and we get to meet several of these women as characters so sexual content and violence are a given in any story exploring that mystery. The Ripper killings were quite gruesome, and while not exceedingly gory in its descriptions this element is not glossed over in this book. Vampirism tends to be rather sensual, and as noted there is a bit of sexual content–not too explicit, but present nonetheless. Also some foul language, but not too gratuitous as I recall. Definitely worth a read!